Student and Teacher Exchange Programmes embody one of the priority aims of internationalism at Mayoor- to foster “Learning in Partnership” with schools abroad. With the essential co-operation of our international linkages in the United Kingdom and Germany, these exchange programmes have become a regular feature of Life At Mayoor. A delegation of 16 students of Mayoor School, Ajmer escorted by 3 teachers went to Friedrich – Eugens – Gymnasium (FEG), Stuttgart for the IX Indo – German Exchange Programme from June 5 to June 24, 2018. A group of 16 students with two teachers and their Principal Dr. Stefan Wilking from FEG visited Mayoor School . They were warmly hosted by the families of Mayoorites. Fifteen Students with two teachers from FEG visited Mayoor School . They were warmly hosted by the families of Mayoorites. Twelve students and three teachers from Mayoor School visited FEG. The group also visited Munich, Switzerland and Austria. Fifteen students with the Principal, Mr. Martin Dupper and two teachers, Dr. Sebastian Fettig and Mrs. Andrea Maurer from FEG visited Mayoor School on a cultural exchange visit for twenty days. Three teachers and eight students from Mayoor visited FEG Stuttgart. They also visited France, Switzerland and Berlin. The duration of the Indo-German Student Exchange Programme was twenty two days. Three teachers and thirteen students visited FEG under the Indo-German Student Exchange Programme; they also visited France, Switzerland and Turkey. The duration of the programme was twenty two days. Students with two teachers from FEG visited Mayoor School under a Cultural Exchange Programme. They were warmly hosted by the families of Mayoorites. The Principal with two teachers and thirteen students visited Germany, France, Switzerland and Italy under the Indo-German Student Exchange programme the duration of which was twenty three days. Students with two teachers from FEG visited Mayoor School on cultural exchange visit of thirteen days and were hosted by families of the Mayoorites. A group of ten students escorted by two teachers from Mayoor School visited FEG under the Student Exchange programme. Students from FEG visited Mayoor School, Ajmer in January 2011. 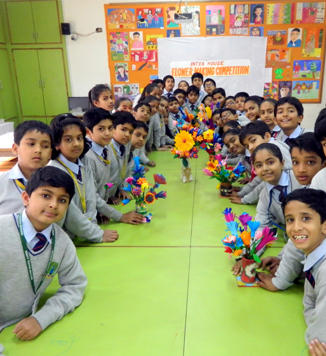 These students were hosted by the students of Mayoor School, Ajmer. A group of thirteen students escorted by three teachers from Mayoor School visited FEG in May 2010 where they were hosted by the students of FEG. Students from FEG were hosted by students of Mayoor School from 19th October 2009 to 9th November 2009. A group of ten and two students from Mayoor School visited FEG from 20th June 2009 to 3rd July, 2009 where they were hosted by students of FEG. Two teachers and four students from The De Montfort School visited Mayoor School under the Cultural Exchange Programme and visited the major cities of the country. A group of two teachers and four students from The De Montfort School visited Mayoor School on a cultural visit for three days. A group of three teachers and four students from Mayoor School visited The De Montfort School for twelve days. The group also visited London and Istanbul. A group of three teachers and seven students from Mayoor School visited The De Montfort School. They also visited London and Cardiff. A group of two teachers and seven students from The De Montfort School visited Mayoor School under the Cultural Exchange Programme and visited major cities of the country. Dr. Nimi Sharma and Mrs. Harshu Verma visited schools in Wales and England as a part of the Teacher Exchange programme with the UK in June 2011. Mr. Antony Soanes, Head Teacher, Bedlinog Community Primary School, Wales visited Mayoor School, Ajmer from 13th to 21st April 2011. Ms. Sindhu Chaturvedi, Head Primary and Mrs. Sumona Gupta, CCA Coordinator (Primary Section), Mayoor School, Ajmer, India visited Bedlinog Community Primary School, Merthyr Tydfil, Wales, the UK and Dunchurch Junior School, Warwickshire, the UK from 15th to 28th June, 2010. Mrs. June Armstrong and Mrs. Sue Robinson from Evesham High School, South Worcestershire, the UK, visited Mayoor School in April 2009. Mr. Sharad Tiwari & Mr. Deepak Bhargava (former teachers at Mayoor School, Ajmer ) visited Evesham High School, South Worcestershire, the UK and Dunchurch Junior School, Warwickshire, the UK from 13th to 25th June, 2008. Mr. Neeraj Kumar Bedhotiya, Principal & Mr. Gary Everette (former teacher at Mayoor School, Ajmer) visited Evesham High School, South Worcestershire, the UK from 11th to 25th June, 2007. A team of teachers from South Gloucestershire, the UK visited Mayoor School from 12th to 14th April 2007. Mr. David Kelly, Headmaster and Ms. Jo Meloni, Director of Sport, Evesham High School, South Worcestershire, the UK, visited Mayoor School from 18th to 23rd March, 2007. Two teachers Mrs. Louise Simmons and Mrs. Tracy Miller from Dunchurch Junior School, Warwickshire, the UK visited Mayoor School from 10th to 15th January 2007, where they interacted with the staff and students.